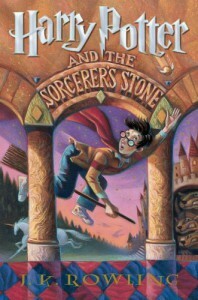 There are times that you need to revisit books that have delighted you, to try to recapture the allure of different, magical worlds that enchanted you in prior years, and J.K.Rowling’s Harry Potter series certainly fills that need for me. Several years ago I was given this book from my daughter as a Christmas present. It was quite usual that I received a book as books were always on my wish list, but receiving a book written for children along with the latest mysterys and thrillers of the day was most perplexing, I couldn’t understand that choice, but not wanting to hurt her feelings I decided to tackle it first. Little did I realize that Rowling was to weave her magic, casting a spell over me, one that is unbroken to this day. I was so taken with the story that on Boxing Day we rushed out to our local bookstore and purchased books 2 and 3 (all that were published at that time) and I was lost in that magical world with Harry, Ron, Hermione, and all the other students and teachers at Hogwarts. I soon learned that I wasn’t alone. At that time I was working in an office with high power corporate executives who had all had somewhat similar experiences. One has to laugh now when remembering the lawyers, engineers, designers and myself delving into the lives of Hogwarts students and how we were so eagerly anticipating books 3 then 4 then 5. With each new release we were spellbound and devoured those pages and happily exchanged views on their exploits. There are critics of these books, but Harry Potter brought so much delight to children and adults alike while instilling a love of reading to so many young people that hopefully will last through their lifetimes. I think this is my third or fourth reading and while missing the mystery of what was to happen next it still delighted me as it had so many years ago. It brought me back into that world of wonder where all things are possible. What a perfect Christmas gift!